Take a shuttle from Banff to Johnston Canyon this summer. Parks Canada is operating a shuttle daily between May 18 - October 6, departing from the Banff Train Station. $5 round trip, free for youth 17 and under. Access: Follow the Bow Valley Parkway west from its eastern interchange with the Trans-Canada Highway 17.5 km (11 mi) to Johnston Canyon. The parking area is on the east side of Johnston Creek. From the rear of the parking area, follow the trail leading across a footbridge to the lodge and trailhead on the west side of the creek. 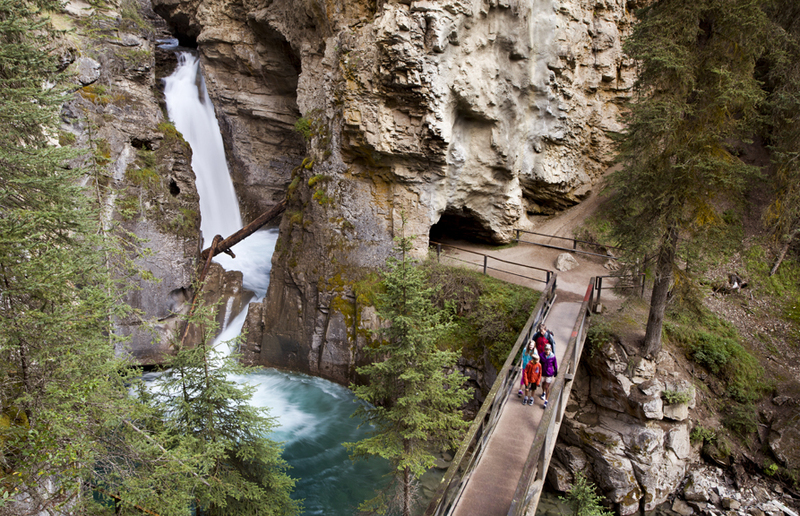 The trail to the waterfalls of Johnston Canyon has to be the busiest in the Canadian Rockies. Nearly every day throughout the summer, hundreds of hikers follow its canyon-clinging catwalks and cliff-mounting staircases to the gorge’s Lower and Upper Falls. While the canyon and its unique trail are certainly worthy of a visit, you’ll have to do the hike in the evening or very early in the morning to avoid the hordes. 0.0 - Johnston Canyon Lodge (1430 m). 2.7 - Upper Falls (1565 m). 3.2 - Junction. Intersection with Johnston Creek trail at km 2.7 (see Sawback Range Circuit). Keep right for Ink Pots. 5.3 - Trail narrows. Gradual descent to Johnston Creek meadows. 5.8 - Ink Pots (1645 m). The trail begins immediately behind Johnston Canyon Lodge. After a short climb through the forest, it descends and stays close to Johnston Creek all the way to Lower Falls. Along the way you pass over sturdy iron catwalks attached beneath overhanging canyon walls, where the turbulent waters of the creek flow beneath your feet. Lower Falls is reached at km 1.1. A bridge across the creek serves as a viewpoint for the thundering cataract, and a short tunnel through the canyon bedrock allows passage to an even more intimate vantage point (albeit a wet one). Back on the main trail, you continue up the canyon via more catwalks and broad, well graded trail. There are many viewpoints overlooking the canyon and a small waterfall. Throughout the journey, scan the creek and its banks for dippers. Also known as water ouzels, these solitary, slate-grey birds are often seen bouncing up and down on streamside rocks. At the 30 m Upper Falls, there are two viewpoints: the bottom of the falls is reached by a side-trail and catwalk leading to a viewing platform; a short steep climb on the main trail takes you to the top of the falls and another viewing platform, which hangs out over the gorge above the waterfall. Ink Pots. A small percentage of those who hike to the Upper Falls continue another 3 km to the Ink Pots - seven cold mineral springs bubbling to the surface in the open meadows beside Johnston Canyon Creek. Above Upper Falls, the trail climbs out of the canyon to join the trail from Moose Meadows. In just over 2 km, it descends to the meadows and the springs, located on the right side of the trail not far from the creek. While these springs are unique (they have a constant temperature of 4C and their basins are composed of quicksand), many hikers find the extended journey above the canyon a bit of a disappointment. Hopefully open views of the Johnston Creek valley from the site offer some consolation. Trail description from the Canadian Rockies Trail Guide (Brian Patton and Bart Robinson; Summerthought Publishing), the original hiking guide to Banff National Park and the contiguous parks.